Causes of hearing loss commonly vary depending on age. Young people can experience hearing loss in one or both ears because of exposure to loud noise, ear wax or ear infections. Gradual aging causes hearing loss in older people. Taking a flight or getting a cold can cause your Eustachian tubes to get blocked, reducing hearing capacity. You can check out the following guide on how to safely unclog your ears. A sinus infection can cause you not to hear from one or both ears. It might be accompanied by nasal congestion and a headache. Once the infection clears, your hearing will also go back to normal. If you can't hear out of one ear, you might have an ear infection. You might feel ear pain and pressure. Children with ear infections produce a fluid that causes hearing loss. This can cause hearing loss in one or both ears. It might be gradual or sudden, especially if water gets into the ear and mixes up with the wax. You might also feel ear pressure. In this case, you will not experience ear pressure. The only thing you might experience is tinnitus which is characterized by ringing in the ears that is mostly accompanied by nerve damage. The inner ear has a delicate mechanism that is particularly sensitive to loud noise (above 85 decibels). If you can't hear out of one ear, it could be as a result of shooting firearms without ear plugs or sitting next to a loud speaker. The damage could be permanent or temporary depending on how close you were to the noise. 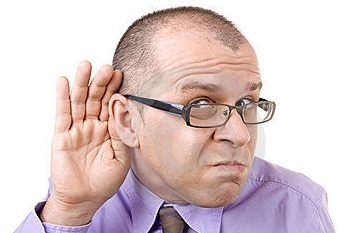 Some drugs can have temporary hearing loss as a side effect. Make sure you are aware of all the possible side effects of a drug before taking it. If you are suspecting you have ear wax and you have no history of a hole in your eardrum or surgery, you can try out OTC wax irrigation and softener. You can buy or prepare your own. Mix warm water with a few drops of mineral or baby oil, a few drops of glycerin and 3% hydrogen peroxide. Lie on your side with the ear you want to drain facing downwards. Put a towel beneath your head for any excess water that spills. If you cannot lie down, tilt your head as much as you can. Pull the edge of your ear lobe upwards, making it perpendicular to your neck. You can use a bulb syringe, glass measuring cup or a plastic syringe. If you are using a syringe, make sure you do not stick it in too deep. Lie down for 10-15 minutes to allow the solution to work. If you are using peroxide, you might hear some fizzing in your ear. Put a bowl beneath your ear and tilt your head such that your canal drains into the bowl. Pull your ear lobe to make it tight. Dry your ear gently after all the wax has drained from the ear. You can use a paper towel or cloth to pat the ear gently. Hold a blow dryer on low heat a few inches from your ear to dry the skin. Most ear inflammations that occur as a result of infections clear out on their own. If you can't hear out of one ear, you should see a doctor, especially when you are feeling any pain, your discharge is oozing out of your ear or the pain is accompanied with a bad headache, stiff neck or high fever. The following remedies may help ease the symptoms or treat your problem. Over the affected ear, place a warm moist cloth to ease the pain, but avoid sleeping with an electric heating pad as it may cause fire. Your doctor can recommend OTC ibuprofen (Advil or Motrin IB) or acetaminophen (Tylenol). Follow the instructions on the label and consult your doctor if you have any questions. For those with intact eardrums, prescription eardrops like Aurodex (antipyrine-benzocaine-glycerin) can provide extra pain relief. For children under the age of 2, do not use benzocaine without professional supervision. Antibiotics can be recommended by your doctor to clear the infection. Make sure you finish the prescribed dose. What Do the Others Do If They Can't Hear Out of One Ear? I could not hear out of one ear and it was because I had a wax build up. I made a solution using equal measures of water and hydrogen peroxide. I used a dropper to pour into my ears and let it work for 5 minutes after which I used a bulb syringe with warm water to get the wax out. I called my doctor after I was unable to remove the wax with the peroxide solution. The doctor used a long tool with a small spoon at the tip and manually removed the wax. The results were perfect. My right ear keeps clogging. However, I do not have to do anything as it clears up on its own after some time. In most cases, the clogging is as a result of a cold. Try using a decongestant and it might work. I went to the doctor and the nurse told me my ears were clogged with wax to the extent that my ear drums were not visible. The eardrops I was using had caused my left ear canal to be inflamed. Luckily, I had stopped using it. She also told me I have otitis externa, and I was given prescription eardrops called Gentisone HC Ear Drops. I have to take them for 10 days 4 times daily.